Keep kitty indoors! Not enough can be said about how defenseless birds – especially baby birds – are when confronted with the predatory instincts of cats. A birds nest in a yard with a roaming cat is a nest which has a very low possibility of successfully fledging chicks. So, if you still have an outdoor cat, before putting up nest boxes, make sure you are prepared to keep your cat indoors. Get rid of that lawn and plant native plants and create a native meadow – this will help birds and all sorts of wildlife including butterflies, frogs and turtles. But nesting bird in particular will find it helpful as they will have a reliable natural food source available during the entire nesting season. Make clean, fresh water available all the time. This is a great rule of thumb year round and especially important when birds are nesting. Stop using chemicals of any kind on your lawn, meadow or garden. Birds are especially prone to picking up toxicity from chemicals that are traditionally used on lawns for fertilization and pets control. If you convert to a native meadow or plantings, your need to control pests will be minimized. In fact, increased avian traffic attracted to the plants may well keep things under control. 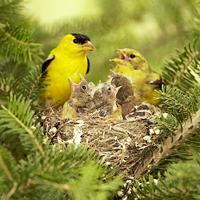 For more info and ideas, check out Cornell’s Nestwatch page on nesting birds.